Anomaly: tree, hovers above the forest floor. 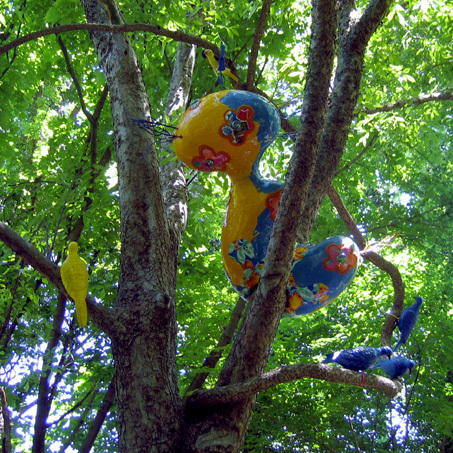 The fiberglass flower blobs make themselves at home amongst the trees accompanied by brightly colored artificial birds. Anomaly for a tree forces the viewer to look up. Directing the gaze to the canopy of the forest challenging our expectation of what we should be experiencing with in the natural setting of the forest grove. Anomaly; tree continues my Anomaly series and my desire to insert the artifice of nature into nature.